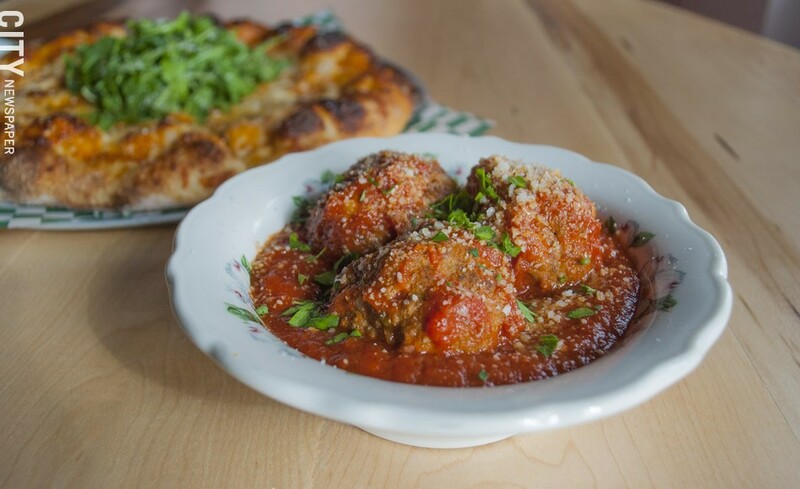 Monday, Wednesday, and Thursday, 4 p.m. to 12 a.m.; Friday and Saturday, 4 p.m. to 2 a.m.; Sunday, noon to 8 p.m.
Papalee's meatballs, served with red sauce and cheese. The strip of Alexander Street formerly known as Restaurant Row has a colorful new arrival — with some familiar faces behind it. The Swan Dive, which held its grand opening March 30, is co-owned by Jon and Paulina Swan and Nick Ryan, who are all old hands in the Rochester bar and restaurant scene, despite all of them being under 40. Jon co-owns Ox and Stone and The Daily Refresher (both on Alexander Street), as well as Dorado on Park Avenue. His younger sister, Paulina, was formerly head bartender at Roux on Park Ave and now runs the kitchen at The Swan Dive. And Nick Ryan, previously behind the bar at Ox and Stone, is now helming the bar program at the new business. The Swan Dive was "born out of wanting to be starkly different from what's available in Rochester," Jon says. It's eclectic in theme, a cross between a dive bar, a Mid-Century Modern living room, an old-school American diner, an Italian restaurant, and a circa-1950 postcard from Miami Beach. Done up in shades of deep turquoise and bright flamingo, the place is practically begging to be your next Instagram post — something the owners say was completely intentional. "We wanted it to be interesting and photogenic," Jon says, adding that the co-owners collaborated on the design and did much of the interior work themselves. "Everyone left their mark here." Miami vibes at The Swan Dive. Patrons who remember the building from its days as Havana Cabana, Benedetto's, or Lloyd's Bar & Grille will recall that the space is an unusual one — deep and narrow, with a mezzanine level that looks down on the first floor. But the new owners have used the building's idiosyncrasies to create several different spaces, each with their own look and feel. Just inside the entrance you're greeted by a long bar that extends down the left side of the room, with ample space to sit or stand. Walking further back, past the food counter, you'll hear and smell the open kitchen before you see it. Gleaming white tiles run up and over the corridor, creating the sense that you're in the kitchen with the cooks, Swan says. 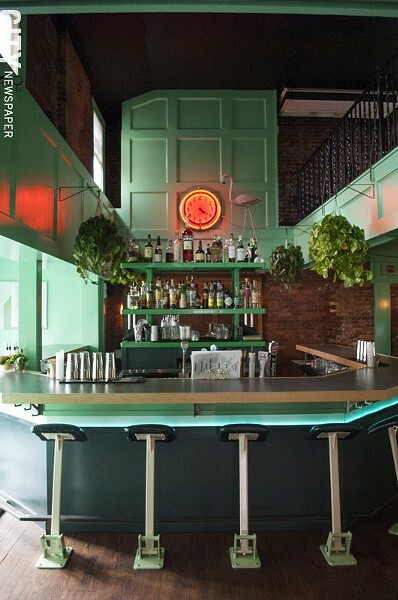 At the back of the space, the main action at The Swan Dive appears to revolve around a U-shaped bar adorned with hanging plants, a cheery flamingo, and a retro analog clock emitting a warm neon-orange glow. Upstairs there are long tables suitable for larger parties, and a lounge the Swans call "The Big Pink," with walls and furniture the approximate color of Pepto-Bismol — though some might term it "Millennial pink." The spacious room features a vintage velour sectional couch in a coordinating rosy hue, a foosball table, a vintage (working) typewriter, and will soon have a dartboard. Jon says he sourced many of The Swan Dive's fixtures from area vintage stores such as Abode. The menu, which Jon describes as "loosely Italian," was designed by Paulina and inspired in part by Los Angeles fast-fine Italian restaurant Jon & Vinny's. Pizzas and pastas share space with American diner classics like chicken nuggets, mozzarella sticks, hot fudge sundaes, plus a foot-long sausage from Swan Market (no relation). Pizza dough is made in house, and the owners anticipate launching a pizza delivery service within the next six months. On Friday and Saturday nights the kitchen will be open until 1:30 a.m.
On The Swan Dive's pizza menu: the Big Pink. During The Swan Dive's grand opening, a friend and I stopped by for dinner around 7 p.m. to find the place doing a steady business, with the majority of patrons clustered around the back bar. My dining companion and I slid onto two bright teal barstools, where we could keep an eye on the bartenders and the open kitchen at the same time. Service is informal and there are no waiters — a deliberate choice that gives the place a more casual feel. Patrons order food at the bar or at the counter, take a number, and a member of kitchen staff brings out the order when it's ready. We started with a dish of marinated olives, served warm with smashed garlic cloves and bathed in olive oil ($4). 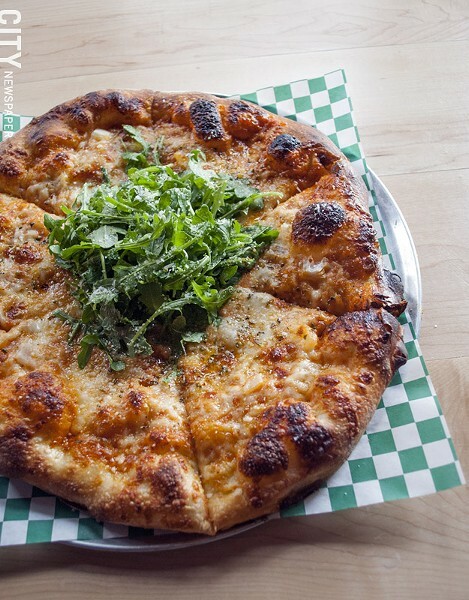 Next we tried the Big Pink pizza, a vodka sauce-based pie topped with mozzarella, Pecorino, onions, and mounded with arugula ($13). The dough was aromatic, tender, and tasted almost unbelievably fresh. Still peckish, (and in the name of research), we finished off our meal with the Papalee's meatballs, which were juicy and respectably-sized and served with red sauce and cheese (three for $5). Disappointingly, the lighting was too dim to snap any Instagram-worthy photos. Though we skipped dessert, we did sample some offerings from the bar. I tried the Start Without Me ($10), a bright, botanical drink made with rye and gin. My companion ordered a Pimm's Cup from the "draft cocktails" menu (all $8), which are available by the glass or by the pitcher. The bar menu was designed by Ryan, formerly of Ox and Stone. Like that establishment, and the Daily Refresher just steps away, the Swan Dive offers some very thoughtful, cleverly-named cocktails, but balances these more complex libations with an approachable beer list (bottles and cans from $3, drafts from $4). With not one but two other Swan-owned establishments a stone's throw (literally) from the front door of the Swan Dive, Jon entertains the idea that he could be potentially competing with himself. However, he thinks the neighborhood has room to grow. "We're devoted to improving the area and to establishing a culture here, from a business and a personal perspective," he says. 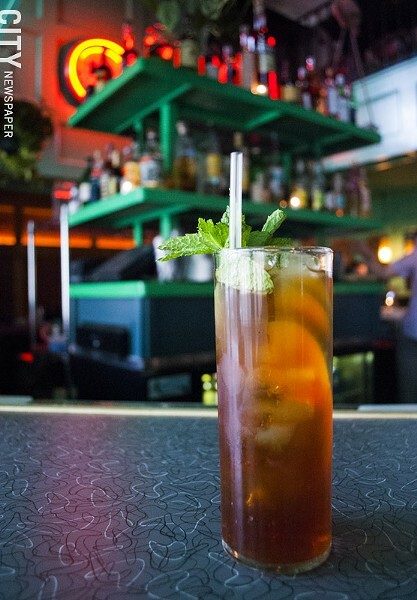 The Pimm's Cup is offered by the glass or pitcher.